Mr. Abbas Noyan, Former Member of Parliament, Senior Analyst; Mr. Ahmad Saeedi, Former Diplomat, Senior Analyst; Ms. Elay Ershad, Former Member of Parliament; Mr. Fahim Dashty, Chief Executive, Afghanistan National Journalists Union; Ms. Fawzia Koofi, Member of Parliament, Women’s Rights Advocate; Gen. Javed Kohistani, Senior Military Analyst; Mr. Nisar Haress, Senator representing Kabul Province; Gen. Sher Mohammad Karimi, Former Chief of Staff of Afghan Army; Ms. Shukria Barakzai, Former Member of Parliament, Afghan Ambassador designate to Norway. 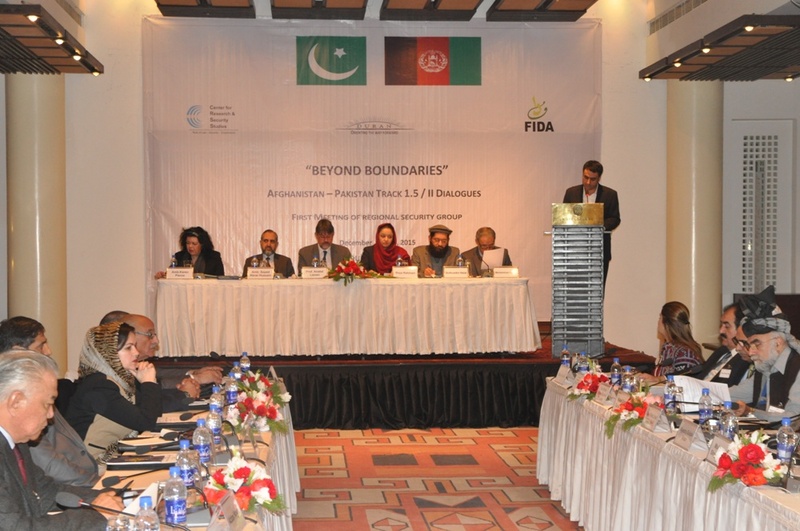 As part of the same initiative and reported above, the Regional Civil Society Group had two round of talks, in Islamabad (November 2015) and Kabul (December 2015). The third in a series of seven meetings, marked the first meeting of the Regional Security Groups between senior security and parliamentary stakeholders from both countries. These talks took place at a time of increased hope for mutual cooperation, particularly in the economic arena, especially after the Heart of Asia Conference hosted by Pakistan in early December and the signing of the TAPI Pipeline in Turkmenistan. The inaugural session was addressed jointly by Director General of Regional Cooperation Ministry of Foreign Affairs Government of Afghanistan Ms. Roya Rahmani, Ambassador of United Kingdom H.E. Karen Pierce, and Ambassador of Pakistan H.E. Sayed Abrar Hussain. The panelists included Mr. Qutbuddin Helal, Presidential Advisor on Peace, and Mr. Mohammad Nateqi, Senior Advisor to Chief Executive’s 2nd Deputy. Professor Anatol Leiven of Georgetown University chaired the session. Other high profile diplomats and notables included Ambassador of Turkey H.E. Ali Seyit Akin, Ambassador for His Highness the Agha Khan H.E. Nurjehan Mawani, Ambassador of Egypt H.E. Mohab Nasr, Ambassador of OIC H.E. Aydin Nurhan, Deputy Ambassador of the Russian Federation H.E. Andrey Vadov, Deputy Ambassador of France H.E. Philippe Merlin, Canadian Charge d’ Affaires H.E. Scott Slessor, and Political Counsellors of Norway and Germany. The inaugural session was also attended by several security and civil society leaders as well as media representatives from Afghanistan. Addressing the panel, Ms. Rahmani thanked the organizers for the great initiative and emphasized on the need to think out of the box, capitalize on our shared interests and work towards mutual cooperation. Closing her remarks she assured of Afghan Government’s Ministry of Foreign Affairs’ full support to this dialogue process. United Kingdom Ambassador H.E. Karen Pierce welcomed the initiative and expressed that as a friend of Afghanistan and Pakistan, UK is a keen observer of the peace negotiations between the two countries. She equally took delight in the successful Heart of Asia Conference of early December and underlined the importance of the statement that came from Pakistan on Afghanistan’s sovereignty, territorial integrity and the National Unity Government being the sole legitimate representative of the Afghan people. She noted that there was a need to translate these statements into a practical process. She added that this proxy war had hurt far too many people in both countries. People in Pakistan faced it in the form of the APS attack in Peshawar and Afghan people felt it on daily basis; she called for a real process to bring peace. She further added that Afghanistan was both a Central Asian and a South Asian country, and the role of Central Asia is incredibility important. Mr. Helal, one of the panelists called TAPI a turning point and project of peace and stability and called for its timely completion. Mr. Nateqi, another panelist, confirming the significance of TAPI, emphasized on the importance of peace talks between the two countries. The Executive Director CRSS also took the Ambassador of Pakistan to Afghanistan, Syed Abrar Hussein, on board; requesting for the mission support for the activities on Afghanistan side. Terrorism in all its forms and manifestations on either side of the border should be condemned. Violence by non-state actors should be condemned and treated as terrorism. Pakistan and Afghanistan should establish clear frameworks to control and stop terrorist financing and dismantle terrorist infrastructure, and other related aspects such as illegal drug trafficking, kidnapping for ransom and arms and narcotics smuggling. Porous border is a major source of instability in both countries; therefore, the group unanimously urges their respective governments to put in place a stronger mutually coordinated border management mechanism. There is a need for a formal mechanism for coordinated security operations on both sides of the border, establish hotlines, and develop other communication systems between commanders on ground, for intelligence sharing and enforcing developing Standard Operating Procedures (SOPs). Urge their respective governments to ensure a check on national and foreign funding of madaris as well as their curriculum in their respective territories. Urge their respective governments to engage media and sensitize them on the need for a balanced and objective coverage so as to contribute to the objectives of peace, reconciliation and bilateral dialogue. A Joint Civil Society Monitoring Commission should be established to monitor and report on the bilateral and multilateral commitments of both governments, with the aim to monitor as well as put pressure for their implementation. In the next meeting, the group will explore the possibility of arriving at a consensus on the definition of terrorism.